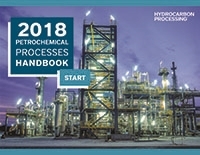 The 2018 Petrochemical Processes Handbook is specifically designed to provide engineers and petrochemical/refining professionals with technical information that they can quickly reference at any time. HPI Market Data 2019 is the hydrocarbon processing industry’s most trusted forecast of capital, maintenance and operating expenditures for the petrochemical, refining and natural gas/LNG industries. For over 65 years, Hydrocarbon Processing's Refining Processes Handbook has been a definitive resource for processing technologies used in the refining industry. HPI Market Data 2018 is the hydrocarbon processing industry’s most trusted forecast of capital, maintenance and operating expenditures for the petrochemical, refining and natural gas/LNG industries. This 136-page handbook is the definitive reference guide for information on coiled tubing operations and services. A one-of-a kind reference source, the Composite Catalog makes your job of purchasing, specifying or recommending oilfield products and services easier.